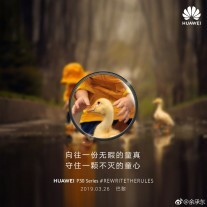 Huawei’s upcoming P30 and P30 Pro flagships have been leaking left and right over the past few months. So much so, in fact, that the Pro variant can even be spotted in at least two sets of hands-on photos, with the latter one actually coming from a media outlet, complete with impressions. 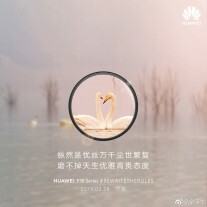 Even so, we still have little confirmed info on what will apparently be the spotlight feature of the new flagship – its periscope zoom camera. 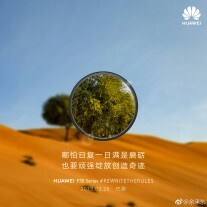 Even the photos we do have, like a 5x zoom from Barcelona or a photo of the Moon, published by Huawei themselves can’t be definitively attributed to the P30 and its new periscope snapper. 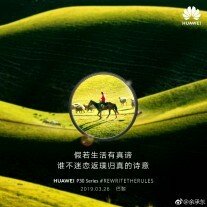 Now Huawei and more specifically, CEO Yu Chengdong, is taking to social media yet again, continuing the #RewriteTheRules marketing campaign. 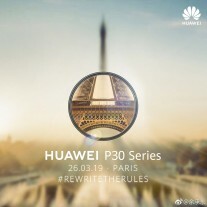 The fresh content we have this time consists of a set of official banners, including the one originally released back in February to announce the P30 series launch event on March 26 in Paris. 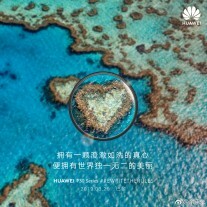 Unfortunately, just like with earlier leaks, we can’t really say with any certainty whether the photos used in these banners are taken straight from the new periscope zoom camera of the Huawei P30. 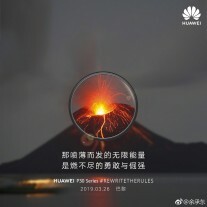 Some of the zoomed areas definitely look authentic enough to be actual mobile stills, while others like the skier mid-air and the erupting volcano aren’t really all that believable. 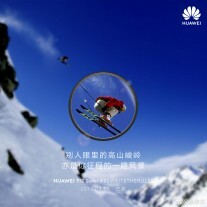 As per leaks, we expect 5x optical and a whopping 10x “hybrid” zoom out of Huawei’s new camera. 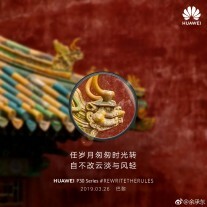 Renders also draw a total of four cameras on the back of the P30 Pro and three on the vanilla P30 – the extra one likely being a ToF sensor. OLED panels, with under-display fingerprint readers and a water drop style notch are expected on both. A curved 6.5-inch one on the Pro and flat 6.1-inch on the regular P30. Also on the list of expectations for the upcoming P30 duo is the familiar Kirin 980 chipset, potentially coupled with the company’s Balong 5000 5G modem. Hopefully 40W fast charging, as well.